Do you prefer wearing high heels or do you love flip-flops? I love the idea of wearing high heels. It feels so powerful. But after being a full-time stay at home mom for over a decade now, I forgot how to wear them! I walk and/or run to the kids’ school just around the corner – in flip-flops if I can! I walk around the house in flip-flops. I go to the store in flip-flops. Unless it’s cold or snowing then I’m in my faux-Ugg boots! But sometimes in life, you have do something beyond your comfort zone. Sometimes it feels good to push the envelope! Sometimes it feels good to try something new! Sometimes it feels good to be different! Sometimes it feels good to do that one more push-up! Sometimes it feels good to wear that red pair of high heels! This month had been just that – getting out of my comfort zone. Next Sunday, October 18 is the Walk Now for Autism Speaks at Nomahegan Park in Cranford. I will be walking for Emma’s Angels. I won’t be wearing my red high heels or my flipflops! Depending on the weather that day, I will probably be wearing my sneakers! Emma is the daughter of a friend of ours. They live here in Cranford, NJ. Emma is an incredibly sweet girl who loves to cuddle and is filled with laughter. She truly enjoys everyday! Unfortunately, she still has not said a single word and is no closer to being potty trained than she was a year ago. We always say to her “please let us in on the joke” when she is laughing her way through the day. Honestly, we wish we could have her ability to laugh at the situation because as more time goes by, the more dire the situation becomes. As more time passes without speech, the likelihood that she will ever speak diminishes. She will need care for the rest of her life, never being able to live indepently. That brings allot of other issues, too ling to even mention here, into play. When we talk about it, many times it becomes too overwhelming, especially for Zach. At 15 it is hard to imagine that you have to care for someone for the rest of their lives. It definitely makes planning for his future trickier than for that of a child with a “typical” sibling. This summer it seems to be hitting me harder than usual that we are not able to do things together as a family. As our extended family is enjoying time spent together at the shore, we are unable to attend. Any change like that is difficult for Emma to handle but something new was thrown into the picture a few weeks back. While at the shore to celebrate my mother in law’s birthday, the house was buzzing with the commotion of all the relatives. As we were all enjoying the festivities, my sister-in-law noticed Emma walking down the middle of the street, head down, with a car coming. I know that there are always angels walking by her side, but if Amanda had not seen her, we may never have found her. She would not know how to find her way back and since she cannot talk, I am not sure what would have happened to her. My heart aches every time I think of what could have happened! Now that we know that she would “escape” like that, it changes everything! Just one more thing to throw in the mess! Those are just a few reasons that I am asking you once again to join us to raise money for autism. I am asking on behalf of my husband and myself, but mostly on behalf of my son, Zach. Please help to make his life with his sister an easier road to travel! We are also still collecting donations for the victims of the typhoon Ondoy in the Philippines. 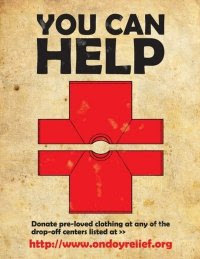 Go to http://bayanihan4ondoy.wordpress.com/ or http://www.ondoyrelief.org/ for details. Trying to make a difference, one small gesture at a time! Jenjen, has your friend looked into sign language for Emma? This would, at least, help give her a means to communicate even if she cannot say the words. There are a lot of resources online about the helpful role sign language plays with regard to autism. Our neighbor's son has autism, and one day their oldest son told his parents to don't worry about his brother when he's older because he will always take care of him!! You maybe stepping out of your comfort zone but what a greater cause! Thank you for your prayers and still praying here for you and your family and your dad. God bless you. Lovely post! I'm going back to read through again and see what I can do. Still praying for your family. BTW, high heels or flip flops? Ever since offices went casual, I stopped wearing heels and torturing my bunions. And I could never stand wearing flip flops - they hurt my toes! But never fear - I step out of other comfort zones A LOT! That was really lovely, Jenjen!! High heels or flip flops? I will go for something in between!! Thanks for stopping by! Spent most of yesterday sorting out the donations for the Ondoy Relief (Philippines).. I'm a sneaker kind of gal. What a great friend you are, good luck in your fundraising efforts. Found you on Mom Bloggers Follow Me Club. I'm following and looking forward to reading more. Thank you for bringing this cause to light. Even if it meant stepping out of your comfort zone. p.s. With the weather being in the 30's and 40's, I totally miss my flip-flops! I loooooove my flip flops! I wear them everywhere although the weather has gotten cooler here so I will have to put them away for the fall/winter. It's like saying goodbye to dear friends lol. @2ToddlerandMe - thanks for the visit and the follow! I wear sneakers once in a while, too! @Momisodes - nice for you to stop by! Yup - it's freezing here, too! I do miss my flipflops! @Mommy24cs - I think we have change of seasons so we can recharge...and be ready for the next one! Trick or treat! 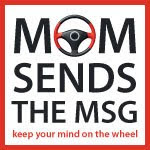 Keep your mind on the wheel!